Carry your cigars in style! 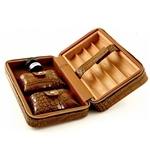 Cigar Star brings you a genuine split embossed leather travel case that holds your cutter, lighter, cigar rest, up to 8 cigars and your cell phone. Luxury and versatility combined. THE ULTIMATE ACCESSORY SET FOR THE AFICIONADO!